Dermatology deals in general with pathological changes to the skin, ranging from eczema through acne to scarring and open wounds (ulceration). The specialisms of doctors are very wide-ranging, and the sphere of aesthetics has been increasingly expanding for some time now. With the combination of skin regeneration and aesthetics, the treatment of the skin from a medical viewpoint has become a perfectly well-rounded concept. LDM®-MED is a further development of the LDM® appliance range from Wellcomet® and is an ultrasound machine specially developed for the medical sector combining two special technologies (LDM®Plus and the 10 MHz frequency). For progressive, holistic skin treatment, the LDM®-MED machine offers treatment opportunities for various skin diseases and programs for non-invasive aesthetic applications. With up to 19 program settings divided into aesthetic and dermatological menu items, the LDM®-MED covers the most important indications, providing an effective equipment-based treatment system for use in dermatology, cosmetic surgery and general medicine. For the body, the LDM®-MED has programs for different body applications such as cellulite, stretch marks and treatments before and after cosmetic surgery. 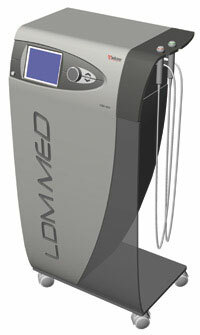 In addition, the LDM®-MED machine can be fitted with a special upgrade for body treatments (see Applications). Treatment is based on a specially developed body concept using the TWL method (Thixotropic Washout Lipolysis). What makes the LDM®-MED machine special is its combination of two innovative technologies -LDM®Plus (Local Dynamic Micromassage) and the 10 MHz frequency, which make the LDM®-MED very different from traditional ultrasound machines. With its dual-frequency ultrasound, LDM®Plus technology combines several physiological effects with each other simultaneously, which means that it can regulate the structure of the connective tissue specifically and effectively in various aesthetic and dermatological indications. With the additional 10 MHz frequency, the LDM®-MED stands out clearly from other ultrasound machines used in cosmetics. In contrast to other ultrasound frequencies, this frequency, with a half value depth of just approx. 0.3 cm, acts almost exclusively in the upper skin layers such as the epidermis and dermis, while the 3 MHz and 1 MHz frequencies with their half value depths of approx. 1 and approx. 3 cm respectively operate mainly in the lower layers. What effect does LDM®-MED have on skin? For a healthy, beautiful skin, the build-up and breakdown processes in the connective tissue must be balanced. If this balance is disturbed, it can lead to skin ageing or even pathological skin changes. The different frequencies and the way they are combined in LDM®Plus technology can modulate the structure of the connective tissue by effectively influencing the activity of particular molecules such as matrix metalloproteinases (MMPs), heat shock proteins (HSPs) and hyaluronan (HA) (see Applications). All of these components (MMPs, HSPs and HA) have an important part to play both in modern anti-ageing concepts and in dermatology, and their correct regulation seems to be essential for effective aesthetic and dermatological treatments. What effect does LDM®-MED have on fatty and connective tissue? The latest area of application for LDM®-MED centres on body treatments to reduce body size alongside dietary measures (see Applications). The TWL method that has been specially developed for this is used to treat locally disruptive body regions. With the "triple layer" concept in Thixotropic Washout Lipolysis, three of the most important areas for successful size reduction are taken into account at the same time. Using the thixotropic effect (converting bound water to free water), LDM®-MED makes a massively important contribution to this by converting accumulated, hyaluronan-bound water in the fatty tissue into free water and thus facilitating effective drainage in the second stage of TWL (washout). But LDM®-MED can also play an important role in injections or as a means of providing care before and after cosmetic surgery. LDM®Plus can help to break up the sub-epithelial tissue, which can improve the result and prevent serious traumatization of the tissue.